Walk through the front doors a Governour’s Square townhome in Reston and you will feel like you’ve walked into a Southern Plantation home. You won’t believe that these homes are only about 1,600 square feet—they feel much too spacious and airy to be so small. These lovely colonial style townhome in North Reston were developed in 1968. They are 3-level homes with exterior brick construction and about 1,600 square feet of living space. The central common area is a great place for children and dogs to play, and the nearby Reston Association paths are perfect for those who like to walk or run. The original floorplans were closed concepts—as was the style in the late 60s. But over the years, some of the owners have remodeled these homes to open them up. In either case, these townhomes are beautiful and comfortable. This small community of townhouses is on the Lake Anne side of Reston. They are less than a 10-minute walk to Reston Town Center, and close to the Wiehle Metro station. The neighborhood is also within a few miles of Trader Joe’s, Whole Foods, Giant, Mom’s Organic Market, and Harris Teeter (Restonians love have choices when it comes to grocery stores). For those with young children, Governour’s Square is also a quick walk to Lake Anne Elementary School. This holiday season, I’ll be spending most of my time at the Lake Anne Coffee House finishing the renovations (more to come on that…). So I’m asking you to go out and do something for me — enjoy the amazing light shows we’re lucky to have in our area. There are three in particular that I think are must-dos. Believe me, you will enjoy them. All three run until January 3, 1016. 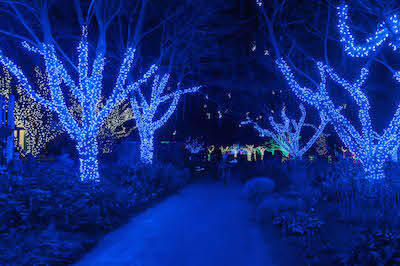 See how more than 500,000 environmentally friendly LED lights transform the National Zoo into a winter wonderland. That’s a lot of lights! ZooLights also includes live music, tasty winter treats, and plenty of opportunities for holiday shopping. New this year is a dazzling light show set to music. Best part: it’s free and open to the public. And for FONZ members, every Saturday night of ZooLights the Elephant Community Center is transformed into The Warm Up and Chill Out Lounge. Celebrity Cruises sponsors this exclusive space, and provides complimentary drinks and themed goodies. A little closer to home — about a 15 minute drive from Reston in Vienna, VA — we’ve got the Meadowlark Garden’s Winter Walk of Lights. They don’t quite have 500,000 lights, but they’ve got a lot. Visit fairyland, watch the frog jump over the lily pad, and see your favorite woodland creatures frolic among the trees. And at the end of the short walk through the park, enjoy hot chocolate and s’mores around the fire pit (or enjoy watching the children enjoy them… that alone is worth the price of admission). You do need to buy tickets in advance (ages 13 and older: $12 | ages 3-12: $7 | ages 2 and younger: Free). If you want to enjoy the warmth of your car while looking at the light show, then head out to the Festival of Lights at Bull Run in Manassas. This show is really fun… especially with a car full of children who are captivated by the lights. Unlike the other two, this light show is open on Christmas and New Year’s day. The admission fees are per car, so load up. And the Festival of Lights is more than just a light show — after enjoying the two and a half miles of light displays, stop in at the Holiday Village. Complete with bonfires, s’mores, holiday merchandise, and free children’s activities, the Holiday Village is fun for the whole family. Of course, it’s also always fun to wander over to Reston Town Center and Lake Anne Village to enjoy the twinkle lights. Sure they are not as spectacular as the light shows, but they are charming nonetheless. And if you see me working away in the coffee shop, stop by and say hi. For more ideas on fun things to do this holiday season, visit the Fairfax County website for ideas. Heron House, the original Reston condos build in 1966, are still among the most beautiful condominiums in Reston. Sure, I may be biased because I live in Heron House, but I've heard other people say this too. Comprised of 46 condominiums all with concrete balconies, Heron House is Reston's original high-rise. It is situated on the edge of Lake Anne at the Southern end of Washington Plaza (which residents simply call Lake Anne). The condos have one to three bedrooms with commanding views of the lake and Reston. Sitting on the balcony sipping a glass of wine and looking at the fountain in the lake is one of my favorite things to do. The contemporary condos are well designed to maximize every inch of space -- even the smaller one-bedroom units feel spacious. Perhaps it is the view, or perhaps it is the well thought out floor plans. Whatever the magic combination, it works. And Heron House has stood the test of time. The design is as relevant today as it was 50 years ago. And most of the units have been upgraded with new kitchens and baths. You never really have to leave the neighborhood -- Lake Anne boasts several great restaurants, the farmer's market, and festivals year round. It's a wonderful place to live! It's also only a one-mile walk along gorgeous trails to Reston Town Center (or a quick drive), and it's close to the Reston Station and Dulles Toll Road. What's not to love? The Uplands is the quintessential Reston neighborhood -- while it is convenient to all major roads, it feels like it is miles away from everything. 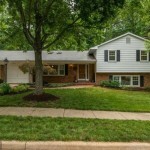 As one of Reston's older neighborhoods, and one that borders Lake Fairfax Park, the wooded areas are well established. Uplands has a great layout with just two access points. While there is a convenient secret short cut over to Rt. 7, for the most part the people who travel on Ring Road live in Uplands. The Uplands neighborhood includes both townhome clusters and single family homes in a wide variety of styles, from ranch styles houses to large contemporary and pretty much everything in between. One of the best features of Uplands is the toddler and young kid-oriented Uplands pool. Okay, adults enjoy playing in the pools fountains too. There is also a huge recreation area that includes two tennis courts, a full sized basketball court, and a baseball diamond. For those who like walking their dogs in the woods, or just going for a great hike, there is easy access into Lake Fairfax park via Buttermilk Creek trail. And in the winter, Uplands has the best sledding hill around. Uplands is about a five-minute drive to Reston Town Center, and same to the Reston Metro Station. But the neighborhood is so tranquil and beautiful, you may never want to leave.